Foreign correspondent, Carey Jackson (Robert Montgomey, Night Must Fall), who is desperate for an assignment, agrees to write an article for ‘Home Life,’ a popular women’s magazine. Jackson soon discovers that the editor of the magazine is no other than his old flame, Linda Gilman (Bette Davis). Jackson and Gilman agree to put personal feelings aside and work on a wedding in Indiana, but war erupts when Gilman realizes that chauvinist Jackson finds the assignment beneath him. 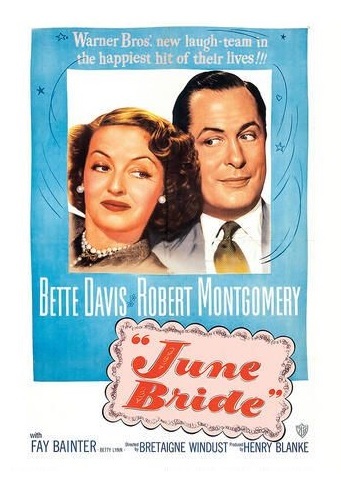 Often considered one of Davis’s weakest Warner Bros. films, June Bride is a slick, entertaining, if unmemorable romantic comedy. June Bride, directed by Bretaigne Windust (Winter Meeting) from a screenplay by Ranald MacDougall (Mildred Pierce) based on the play by Graeme Lorimer and Elaine Tighe, can be best described as an amusingly breezy romcom whose main selling point is the gamely interaction between its two charismatic movie stars. It’s nothing like His Girl Friday (1940), but it is a well-crafted, witty movie that deserves a watch at least once. Although June Bride is definitely dated now, this is a delightful piece of fluff. There are hardly any surprises, but the story moves fast and the acting is pretty good. Edith Head’s beautiful gowns also make the film look very chic. The ending almost made me throw up, though. After establishing Davis’s character as an intelligent, highly successful, self-sufficient career woman (she gives a terrific monologue about gender inequality), the script does an about-face and Davis is forced to accept Montgomery’s “superiority.” The fact that Davis, of all people, capitulates so abruptly, so crudely, is enough to cast a dark shadow over the entire movie. Davis rarely made comedies. She is just not suited to the specific timing that comedy demands. This is one of her best roles in a film of this type. Davis succeeds where she had failed before because she isn’t really working for laughs. Her role is pretty straightforward and she’s essentially playing Bud Abbott to Montgomery’s Lou Costello. It works for the most part. Despite the fact that they didn’t get along, the actors look good together. Fay Bainter is wasted in a superfluous role as Davis’s assistant. She, of course, had won an Oscar for Jezebel (1938) and I was expecting a lot from her re-teaming with Davis. I was sad to see her being reduced to a nothing role. 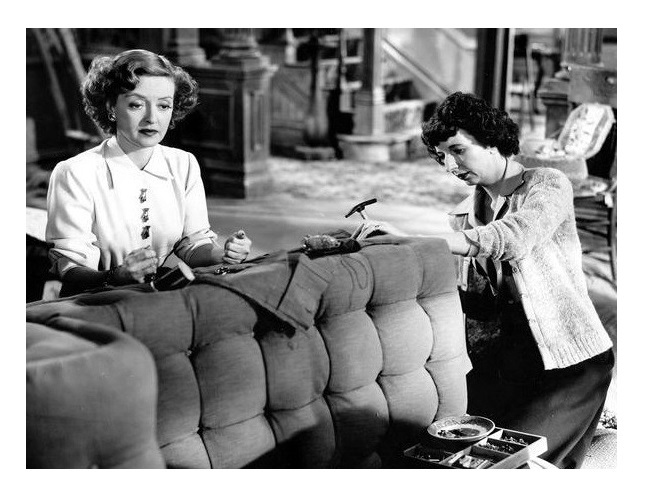 The fine cast also includes Mary Wickes (Now, Voyager), Betty Lynn (Payment on Demand), Tom Tully (The Caine Mutiny), Barbara Bates (All About Eve), Marjorie Bennett (What Ever Happened to Baby Jane? ), and Jerome Cowan (Mr. Skeffington) as Davis’s boss. Because it was released so close to Winter Meeting (1948), one of Davis’s biggest duds, June Bride‘s under-performance (for a Davis film) at the box office was viewed as a sign that her career was in trouble. 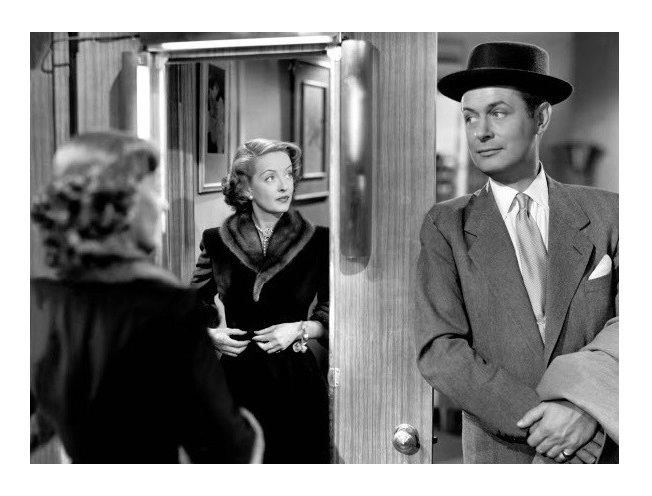 Posterity has not been kind to the movie either — it pales in comparison to Davis’s greatest hits like The Letter (1940) and Now, Voyager (1942). Minus the finale, however, I enjoyed it. It’s an amusing little movie. Watch for Debbie Reynolds, who makes her film debut as an extra in the wedding scene — Reynolds would later co-star with Davis in The Catered Affair (1956). B&W, 96 minutes, Not Rated.